This is the ultimate ethnic vegan bundle! Italian food is considered by many to be the best in the world and has been voted the most popular ethnic food in America. This book is for anyone who wants to go vegan but is afraid of giving up one of life's greatest ethnic foods - Italian. Let this book open your mind to the possibility of Italian vegan food. It has a list of Italian vegan recipes that are classified by type: Italian vegan sauces, Italian vegan breakfast recipes, Italian vegan soup recipes, Italian vegan salad recipes, Italian pasta recipes, and Italian diet recipes. This book is on vegan Mexican recipes. Mexican food is among the most popular ethnic foods in the USA and is also gaining popularity across the globe. The variety of spices, herbs, condiments, and desserts have long been loved in America. Mexican cuisine is extremely luscious and eccentric. It’s a fusion of recipes from many different nations, especially those that have a predominantly Spanish-speaking population. The Mexican cuisine is famous for its unique and tasteful style. The recipes mentioned in this book have been made keeping in mind this essence of Mexican cuisine. You’ll definitely find the fiery deliciousness that generally accompanies Mexican cuisine in all the recipes. Asian cuisine is very versatile, and the vegan recipes will keep your taste buds tingling. You can incorporate the flavor explosion of Chinese meals into your daily cooking by following the simple and easy recipes that have been mentioned in this book. Going vegan was never this fun. So, why don't you pick a recipe that you would like to try and get started! The Mediterranean diet refers to foods that were consumed by the Greeks and Italians in the early 60s. This diet is well known to make people healthy and enhance their longevity. It has been embraced by people all over the world due to a variety of delicious and healthy recipes that can be eaten all day. There are thousands of restaurants across America and across the globe that are successful due to the popularity of the cuisine. Excellent collection of vegan options. Very pleased I went ahead and checked this one out. Always on the lookout for new and interesting vegan recipes. Glad I gave this one a try. Lots of delicious options to choose from. So far everything has turned out great. loved this book. very informational and very good resources on how to become a vegan and why. great tips as well. I was completely absorbed in listening to this material. I believe that it has changed my life in a way that I am exploring more ways to become a vegetarian and implementing meditation into my life. Very informational and love that it has meal breakdowns to help beginners get an idea of meals. Thank you for sharing. 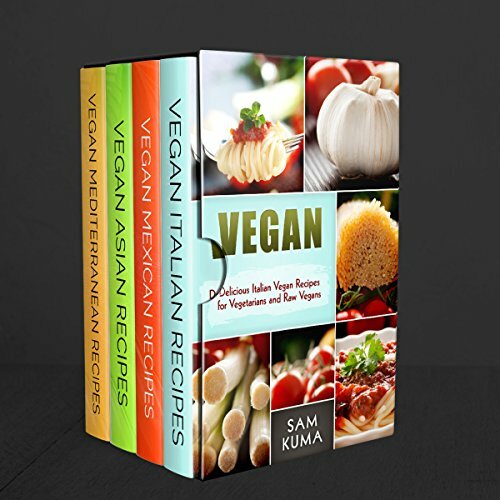 Ethnic Vegan Box Set 4 in 1: Dairy Free Vegan Italian, Vegan Mexican, Vegan Asian and Vegan Mediterranean Recipes for an Amazing Raw Vegan Lifestyle by Sam Kuma is one terrific box set meaningful in your audible. The author of the book took the time to share all his thoughts and that is what I appreciate the most. Mixture of recipes from different countries. Wow! There are Italian, Mexican, and even Asian cuisine in this recipe book! Oh, I can’t wait to start exploring and devour them later! It is a more than 5-hour read, but I didn’t actually mind listening to it. I listened to it yesterday when I was preparing breakfast and I couldn’t help but feel fascinated with this. It is a one-stop shop guide I could listen to all day. A variety of recipes that suit me. And because I am a vegetable-lover, I figured this would serve me well. It is a box set I’m also considering to buy its paperback version. I found a variety of recipes that suits my tastes. The recipes comes inspiring, if you've never cooked Mexican food before, it might be useful, I'd recommend this vegan cookbook. I was fortunate to have purchased and listened this book. It would be a great resource for both long term Vegans to those considering to go Vegan. Easy to follow instructions and all recipes are totally delicious for any day of the year or special occasion.. It is great to be able to make vegan versions of these wonderful ethnic dishes.